Two different groups investigate the radial distribution of blue straggler stars in separate globular clusters. One team finds a unimodal distribution of blue stragglers in NGC 6864, while the other finds a bimodal distribution in NGC 6229. These two different results point toward the underlying mechanism for these stars’ formation as well as the evolutionary dynamics of the globular cluster itself. The origins of blue stragglers have been debated since their discovery in 1953 when Allan Sandage first identified a group of stars that appeared to be hotter and bluer than other stars with the same luminosity. They appeared only in globular clusters, and looked much younger than the rest of the stellar population, lying along an extension of the main sequence, above the turnoff point (see Figure 1). They soon became known as ‘blue stragglers’ because these blue stars appear to straggle behind their companions in their evolution. Figure 1 – The Color-Magnitude Diagram for M3 (Sandage 1953), with blue stragglers circled. Blue stragglers have since been found in open star clusters, stellar associations, and nearby dwarf galaxies. Only last year astronomers announced the discovery of blue stragglers in the Milky Way’s bulge. The very existence of blue stragglers, however, is baffling. Why should stars exist above the main-sequence turnoff point? What astrophysical processes lead to stars that appear hotter, bluer, and younger than their neighbors? Their added mass may be the biggest clue. Since mass determines main sequence lifetime, if a star was born with low mass but then increased its mass at a later point during its main-sequence evolution, it would live longer than a star that initially had a larger mass, and thus stay on the main sequence even after these other stars evolved. The two main mechanisms that have been proposed to increase mass are (1) mass transfer in short-period binaries, and (2) collisions between stars. See Chris’s astrobite for a more detailed look at these formation mechanisms and previous attempts to study them. These two papers, however, do not focus on the origins of blue stragglers, as fascinating as they may be, but rather their radial distributions. What might the positions of blue stragglers within globular clusters tell us about how these mysterious objects formed, as well as about the dynamical evolution of the globular cluster itself? Gravitational interactions between stars lead to many types of dynamical evolution in globular clusters, the most common of which is mass segregation. Over time the most massive stars slow down and fall to the core of the globular cluster, while the less massive stars gain speed and move to the cluster’s periphery. Because blue stragglers are more massive than the other main sequence stars in the cluster, we expect that they will reside in the cores of globular clusters, as long as enough time has passed for mass segregation to occur. Previous observations seem to suggest that blue stragglers generally show a bimodal distribution: they are preferentially located either near the center of the cluster or at its outskirts, with a notable deficit at intermediate radii. Dynamical simulations explain this bimodality by suggesting that the observed central peak is due to blue stragglers formed by collisions, while the upturn is due to blue stragglers formed by mass transfer. The cores of globular clusters, where most blue stragglers reside, is simply too crowded to distinguish individual stars using ground-based telescopes. As an example, the globular cluster: 47 Tucanae has a central surface density of approximately 3 stars per square arcsecond. A ground-based telescope, which will be limited by the effects of the Earth’s atmosphere to a resolution of about 1 arcsecond, will thus not be able to spatially distinguish these three stars. Observing from space removes this limitation entirely, where the resolution of the telescope will only be limited by the size of the mirror and the wavelength of light observed. The Hubble Space Telescope (HST) is a good choice for observations in crowded stellar systems: in addition to giving better resolution, allowing stars in the core to be observed, it also provides excellent sensitivity, allowing the fainter stars in the outskirts to be detected. HST has thus made it possible to survey the blue straggler population over the entire radial extent of globular clusters. Both teams used a combination of high-resolution HST Wide-Field Planetary Camera 2 (WFPC2) and wide-field ground-based observations in ultraviolet and optical bands to obtain the first complete samples of the blue straggler star populations in their respective globular clusters. Let’s now take a look at the two examples in these two papers to understand what exactly these distributions tell us. We will find that one globular cluster shows the expected bimodal radial distribution of blue stragglers, while the other does not. Figure 2 – Distribution of blue stragglers as a function of the radial distance from the cluster core. The top two panels show the ratios of blue stragglers to horizontal branch stars and red giant branch stars, respectively. The high central peak can, minimum at 40 arcsec, and upturn at larger radii are evident in both panels. Sanna et al. observed 64 bright blue stragglers in NGC 6229. The team then computed the center of gravity and radial density profile of the cluster using precise star counts, allowing them to analyze the radial distribution of blue stragglers. 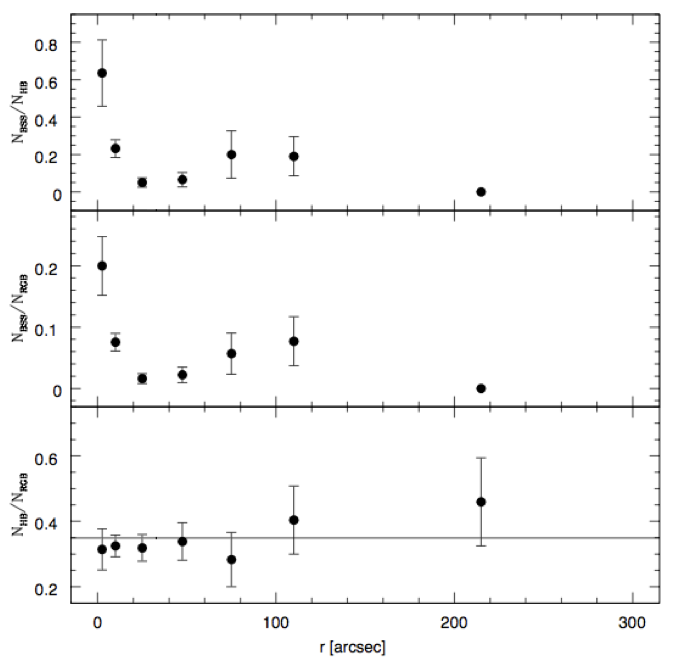 The team found that the blue straggler distribution in NGC 6229 is clearly bimodal (see Figure 2): there is a high peak in the center, a minimum at r ~ 40’’, and an upturn in the outer region. The central peak in particular is very high: ~67% of the entire blue straggler population is located within 10’’ of the cluster center. This bimodality agrees with expectations: it is both seen in simulations and observed in many previously studied globular clusters. 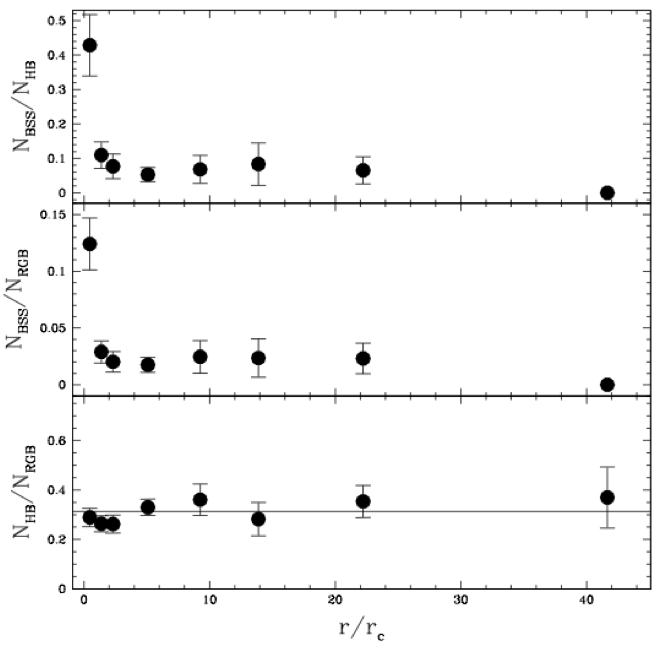 Figure 3 – The distribution of blue stragglers as a function of the radial distance from the cluster core in NGC 6864, normalized by the number of horizontal branch (top panel) and red giant (middle panel) stars. In contrast to the bimodal distribution of NGC 6229, only a high central peak can be seen. When you thought blue stragglers couldn’t be more enigmatic, check out this globular cluster. Ramos et al. 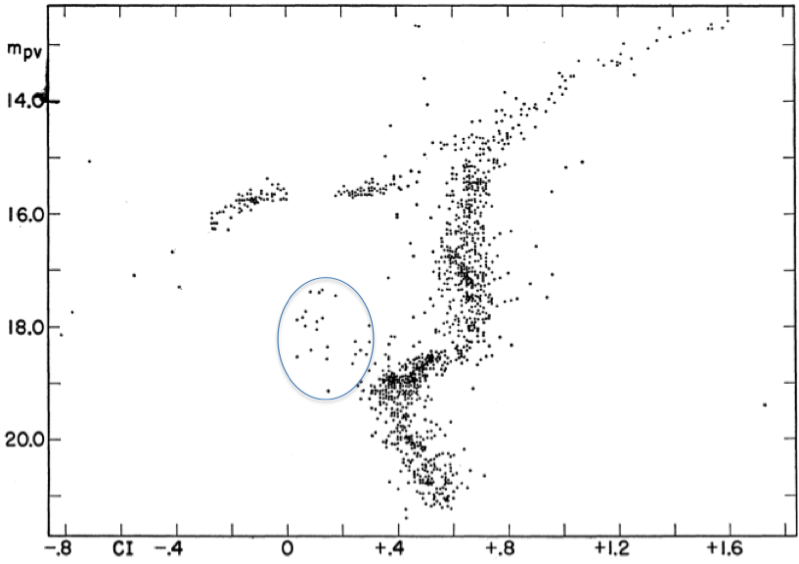 performed a detailed study of the blue straggler population (consisting of 62 bright blue stragglers) and its radial distribution in NGC 6864 (see Figure 3). Just as in NGC 6229, the team found that the blue stragglers were highly segregated in the cluster core, however in this case the authors found no significant upturn at the periphery. In fact, approximately 60% of the entire blue straggler population is found in the cluster core, while only 10 – 15% of the red giant branch and horizontal branch stars are found in the same region. Thus there is an overabundance of blue stragglers in the center, one of the largest ever-measured in a globular cluster. As discussed above, dynamical simulations predict that some blue stragglers – those formed via mass transfer – should exist far from the core of globular clusters. This is clearly not observed in NGC 6864. Ramos et al. find only 3 blue stragglers between 90’’ and 150’’, which is not statistically significant: 6 blue stragglers would be needed across these outer radii for an outer peak to be detected. NGC 6229 is representative of a “typical” globular cluster: the blue straggler radial distribution is bimodal. This suggests that blue stragglers were formed by collisions in the core, and by mass transfer in the outskirts. It also suggests that mass segregation has not concentrated all of them in the center yet. In contrast, NGC 6864’s blue stragglers have a unimodal radial distribution. This implies that either blue stragglers formed only through collisions, or that mass segregation has occurred and the blue stragglers formed by mass transfer have fallen to the center of the cluster. An interesting further development of this research would be to compare the blue stragglers’ locations with their spectroscopic signatures. Such properties will hold yet another set of clues as to the origin of the blue straggler. For example, if the spectral lines of the blue straggler are broadened, it is most likely rotating quickly, meaning it was caused by a collision. Or if the spectral lines are more hydrogen rich, it was most likely caused by a mass transfer. These are only a few examples. Observing NGC 6864 in this manner should allow us to differentiate between the two theories. We will find that either all blue stragglers in the core formed through collisions, or that there are blue stragglers in the core which were formed by mass transfer, signifying mass segregation. Until further research may be conducted this remains an open question.